During Morrison Design’s significant development period through the 1950’s, we were invited by Derbyshire’s county architect, Hamer Crossley, to design a new school utilising an Austrian system concept of timber prefabrication. We proposed to him that we should initiate and design a UK based timber system, in place of the Austrian system, in collaboration with Messrs Vic Hallam Ltd. One that could be replicated across the country. 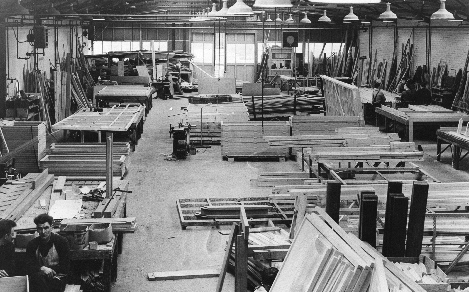 Our idea for a British prefabricated system came when Vic Hallam was liaising with a local educational officer, who had discovered that there was a major nationwide shortage of classroom space following World War II. They needed a fast, rationalised and robust design that could be repeated easily. The proposal was accepted and the ‘Derwent’ timber-frame system was born – an innovative, modular prefabrication system, designed principally for speed. The first school completed was at Hackenthorpe in north Derbyshire. This became the first of a prodigious programme of work in schools and other building types in that system for both Morrison Design and Vic Hallam. The practice quickly expanded and the development of this system significantly contributed to the success of our early years. ‘Derwent’ Timber-Frame System used originally for new-build schools, demonstrated here at Vic Hallam HQ. Tenders were soon awarded for further projects in Derbyshire, Nottinghamshire and Yorkshire, including Birley Infants School which set a European record for a build-time of just 108 days. The design was congratulated for it’s innovation and efficiency. Interest in the ‘Derwent’ prefabrication technique spread rapidly through the industry and the practice was later involved in 16 more school projects across the midlands. 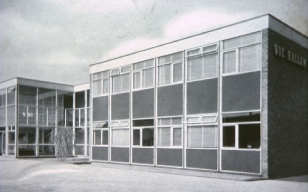 Locally, the most well known Derwent system building was the Aldercar, built in 1955 – now the Aldercar Community Language College. The brilliance of the concept was that it had been designed so robustly that it was not confined to classrooms alone, and thus, the ‘Derwent’ system remained in prolific use for decades after the post-war school design era.